Sheep Events in the Netherlands! The Netherlands (AKA Holland) is probably much better known for its cheese, tulips, and clogs than for its sheep and fibre products. For this New Zealander, the fields look quite empty, with much of the grassland being used to grow hay. Fences are missing as paddocks are split up with networks of small drainage canals, crossed with little bridges with what look to be stand alone gates to nowhere scattered around the landscape. However, if you take a drive out in the countryside you will certainly still see animals, black and white Friesian diary cows (of course for the cheese!) graze alongside the many wild white swans, and there are always sheep. Not in the numbers I am used to seeing in New Zealand, but pockets of happily grazing sheep at regular intervals where ever there is farmland. And what kind of sheep are these? I did some sleuthing, and found that there are actually a number of very well established, distinctly Dutch sheep breeds. One of the most well known would have to be the Texel Sheep, or Texelaar in dutch (pronounced Tess-el-aar) originating from the island of Texel in the north of Holland. Another very popular Dutch origin breed is the really pretty Zwartbles – which literally translates to ‘black stripe’, and so describes the standard appearance of this black sheep with its distinct white blaze (bles). These sheep are quite sweet and have a gentle nature, they are often found in the many childrens farms throughout the Netherlands. I found some of these sheep at the Stadsboederij De Vos Heuvel (City farm, The Fox Hill) in Amersfoort. This is, of course, not big time farming with flocks of fleece and meat producing sheep, but it does have sheep, and they do need shearing. So each year there is a day planned to make an occasion of this, to celebrate the shear and educate the public about the sheep and the process of shearing them. On this occasion, there was a ‘Wolfestival’ (Wool Festival) planned around the event, so the farm was filled with stalls, people selling their handmade woollen items, yarns, roving, knitted and woven garments, spinning equipment, and also demonstrating their crafts. When I arrived at the festival I discovered that the shearer was just finishing the job of shearing a Zwartbles, and it was almost asleep! The sheep on these mini-farms are very accustomed to being handled, and the Zwartbles is known for its easy going nature, apparently this one was very relaxed during its shearing! I was used to seeing freshly shorn sheep scrambling to their feet and scampering down the shute to join their mates in the pen as fast as their little legs will carry them, what a surprise to see this one relaxing and enjoying a manicure for the entertainment of the onlookers! Bear in mind that this was a demonstration shear, not the full-on production shear of a New Zealand shearing shed with all handpieces blazing (and associated noise and activity, so I guess the sheep was quite enjoying the attention! Of course, as a spinner and fibre junkie, I had to go check out the fleece that had just come off this happy sheep. It’s a rich dark chocolate brown/black at the base, lightening up to a light coffee colour on the tips, due to weathering. The fleece holds together well, is not heavily greasy, and the fibres, while not having a well defined crimp, have quite a lot of bulk, and are quite fuzzy rather than smooth and even. Staples are typically about 4-5 inches (10-12cm), and have a micron range of about 28-35. These sheep were mostly bred for meat and milk, but clearly the fleece is very usable, durable, and the colour is lovely! I noticed that the shearer used some different techniques from those I was used to seeing in New Zealand. She held the sheep more loosely and less cradled against her legs, but then, this was a sheep that didn’t struggle, and she wasn’t going for speed so much as showing how the wool comes off. The general comb strokes and fleece removal pattern was the same, the main point of difference that I noticed was that these sheep have tails, which of course also need shearing! New Zealand sheep are almost always docked, but here in Holland it’s quite usual to leave them undocked, in fact I believe the docking of sheeps tails was banned in 2008. Following shearing, the sheep had her toenails clipped (I wasn’t kidding when I said she had a manicure! ), was drenched and off she trotted back to her lambs, ready for the summer. After the shearing demo I went on to explore the market stalls. This was a pretty small market with about 15-20 stalls. An interesting thing about Holland, is that, on first glance, it doesn’t seem like there is much going on here in the fiber arts. There are no easy to find shops selling spinning equipment or materials, not even a yarn shop for knitters in many towns, and finding raw materials and essentials such as dyes and speciality fibres is a challenge for a relatively new Dutchie like me, and none of my Dutch family or friends had a clue where to find things I needed either. Its particularly challenging to find speciality products, because of course, there is an entire vocabulary specific to spinning and wool crafts that has to be learned to even be able to ask the right questions about what you’re looking for! Over time I am finding the right words, and what I AM discovering is that once you scratch the surface, and find one or two people who have a fibre obsession too, you start to find more and more, and its fascinating to find out about these people and places, each discovery feels like a mini-triumph in which I have battled the odds of language differences, swum the straights of geographical disorientation, and climbed the mountain (figuratively, this IS Holland afterall) to find the direction marker at the top and sifted through to the gold beneath! I don’t ‘think’ I am exaggerating! As a foreigner it takes time to find your way around a new country, and spinning and fibre art is a a relatively small niche in Holland, despite the fact that one of the worlds better known spinning wheel manufacturers, Louet, is a Dutch company! However the information needed to find fellow spinners and quality suppliers is not in most peoples common knowledge. But I have discovered that there is a ‘National Spinning Group’ with 600 members, who hold a special ‘Spin Day’ once a year that is well attended. And there are smaller groups who meet regularly in various towns around the country each month. I also found, at this small Wool Festival day at a modest public educational farm, a number of people doing beautiful work with yarns! I first met ‘Wol met Verve’ who were selling some wonderfully bright hand dyed millspun and handspun yarns, and I also bought some vibrantly dyed silk caps from them to spin for myself (mwahahaha! ), I found Weefatelier Annie (Weave Studio Annie) weaving a beautiful scarf on an Ashford loom who, although she lives quite a long way to the north, is tempting me tremendously with her suggestion that she gives weaving lessons. 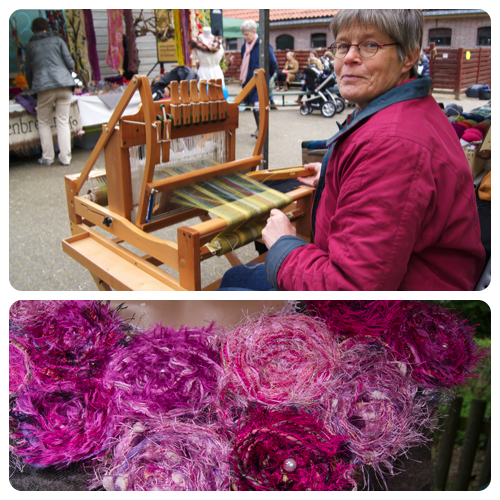 Next to her, and equally chatty and knowledgeable, was Jeanette Kok Biltges, spinning a lovely fine thread on her Louet S10, which she had brought along in place of her Majacraft Rose as she was worried it might rain! She has a blog (in dutch) http://www.engelengeduld.blogspot.com/ which I checked out, and again, discovered gold, notices of upcoming Wool related events, including a trip to an island in the Lauwersmeer (lake) to picnic and have a day spinning outdoors! 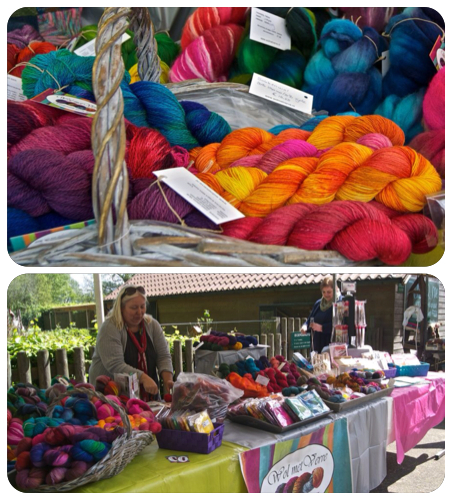 The Wool Festival was small and cosy, and brought pleasant surprises, a bag full of raw Gotland and some silk to spin, some new connections with other fibre people, and new knowledge of the Dutch sheep I see frequently and have always wondered about. In the Netherlands, this crowded, urbanised country, I believe that its these smaller events that really support the existence of creative communities, and its wonderful to see the next generation being involved in learning about, and maybe being inspired by, the whole process from sheep to garment. Hi, I have the opportunity to purchase a Moswald spinning wheel. can anyone tell me about them? i am looking to know what are the biggest sheep and veal producer in Netherlands ? Thank you for doing a blog about this! My ancestors were from the Netherlands and am wanting to spin some of the same fiber that they could have possibly spun. In the past few days I just ran across someone on etsy.com that sells Zwartbles wool; I’m off to go purchase some now! Thanks again! Have a Wonderful day and a Better tomorrow! 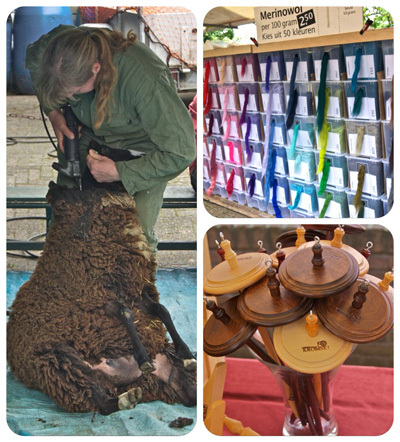 please let me know about any upcoming wool events in The Netherlands – thanks!